Restorative dentistry is the branch of dentistry which deals with correcting dental defects in individuals. There are different types of procedures which can be undertaken for correcting a dental condition procedures depending on the problem and overall dental health. While teeth can be one of the most attractive features that an individual possesses, they are unfortunately subject to a lot of issues over the course of a lifetime. If you think about it, teeth really do take on a beating over the course of a lifetime. You use them to chew things up every day of your life. They are also subject to damage when playing sports, getting into fights or any sort of accident. Teeth loss can happen to anybody at anytime. As a person starts, ageing teeth becomes weak and starts showing signs of decay and damage. Teeth loss can also occur due to unavoidable accidents. Some people can experience tooth loss due to neglect in their dental care. However, the good news is that there is help for you to deal with the condition. There have been great strides in the area of dental restoration. Not that long ago dentures were not very attractive nor were comfortable. During the 1700's dentures were made of wood. Can you just imagine how difficult they must have been to wear? Following the wooden dentures; dentures were made of vulcanized rubber having bone or glass teeth set into them. Today's dentures are light-weight and made of plastic which is a chemical composition of polymer and monomer. Your dentist can offer you options for tooth replacement depending on your particular situation and will discuss are what kind of replacements are available. If you have only a few teeth to be extracted you may want to have the new teeth placed into the open sockets instantly and bonded to each other and the anchor teeth. Also for a few teeth you may have a partial denture that can be clipped onto or attached to the anchor teeth. For more extensive replacement, removable or permanent dentures, known as implants, may be recommended. Teeth that need repair after an accident or excessive decay can be treated by using a crown, aslso called a cap, which is an artificial replacement for the upper portion of the tooth. 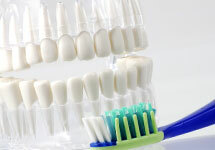 Dental crowns and caps are routine procedures used in cases where a tooth is missing, broken or in need of protection because it is weak. Your dentist will take an x-ray of the tooth before deciding whether you need a cap or dental care, and discuss your options with you. If you have any questions, please ask before your procedure is in progress. A root canal can be done before the crown to avoid the risk of infection. The area of the tooth to be treated is numbed using a local anesthetic. Once the tooth is the size and shape of the crown to set properly, the material is applied to make an impression. The impression is sent to be processed in a crown. You must return to the office to have the crown put in place after construction. Whatever construction is used to replace a missing tooth is called a dental bridge. Teeth are sometimes lost as a result of an accident or of a dental extraction. This bridge, which attaches to the teeth on either side of the gap, is simply a false tooth. These teeth are abutments, like those on a road bridge. The false tooth or teeth used to fill the gap are called pontics. Attached to these abutment teeth are crowns which form the anchor for the bridge. The pontics are made of gold, porcelain, alloys or a combination of any of these. Bridges ensure alignment of the existing teeth and restore the ability to chew properly. Incorrect tooth alignment leads to incorrect jaw alignment, which may result in long-term headaches and neck ache. Missing teeth can cause speech impediments or slurred speech. Bridges help maintain your smile and maintain the shape of your face. Complete dentures involve a step of removing all of your teeth. This removal process will generally take about 2 or 3 months for removal and healing. With this, the individual may be without teeth for this time. However, their teeth will be replaced with a denture after the healing is finished. Partial dentures are basically dentures that are put in as a bridge between already existing teeth in the mouth. These will be held in by a wire framework behind the tooth and it will be removable. You may be a candidate for a flexible denture, which looks like traditional hard acrylic denture but it has a liner that acts just like a shock absorber between the base and your gums. The flexible denture is almost indestructible. One of the newer ways to have your dentures fitted is to look into immediate dentures. They are put in as soon as the natural teeth are removed. It is necessary to plan ahead to get replacements done the same day natural teeth are taken out. A dentist will measure out the inner mouth, facial features and head structure of a patient to determine the size of dentures that will be made to suit your facial and head structure. While these will need to be adjusted as the jaw bone heals, these can be the right dentures for those that may have gaps in their front visible teeth. Conventional dentures require that you be without teeth for a few months as the dentures are being made, these dentures tend to fit a lot better than the immediate dentures. You will have your teeth extracted and your gums will have time to heal as your new set of teeth is being made. Many people wearing dentures will find that after a long period of use the dentures may not be fitting as they were initially or may be moving and become less secure. It has also been seen that over time the gum line may change and this will create an issue with the fit of the dentures. Improperly fitting dentures can cause a lot of discomfort and other issues, such as irritation along the gum line as well as possible infection if not cleaned properly. Getting new dentures will have a number of positive outcomes to those still wearing old and inadequate dentures. Some of these benefits will include and improved jaw line and smile as well as improved functionality. A properly fitting set of teeth will help with the ability to eat and chew decrease the chance of infection and irritation and will also have a positive effect on the ability to pronounce certain words.